This past week Don Busath, a master photographer and someone who I consider one of my mentors passed away. I met Don in 2010 when Becca and I moved to Salt Lake City. Our first Sunday there, I sat down in a pew at church felt a soft tap on my shoulder. When I turned around to see who it was, Don introduced himself and his wife Donna. During the next few years Don was very gracious to assist me with photographs and interviews for three documentaries (Salt Lake City: A Downtown Story, Brigham Street: Salt Lake City's Grand Boulevard and Temple Square). I enjoyed getting to know Don during this time and was inspired by his images and personal history. Don and Donna Busath outside their South Temple photo studio in Salt Lake City. Don grew up in Salt Lake City and was introduced to photography as a teenager by his uncle. At age 18 he purchased his first camera and was hooked. After getting married and starting a family, Don worked as a ventilation mechanic in a downtown Salt Lake City office building and played trombone in the evening to support his family. With what spare time he had, Don did freelance portraits for friends and neighbors. From his first roll of film, Don always saw himself as a professional and worked like one. Eventually Don was able to get a job working for Hal Rumel at his photo studio. This relationship lasted fifteen years and gave Don experience doing a variety of work including portraiture, aerials and commercial photography. Eventually Rumel retired and Don and his wife Donna opened their own studio on State Street in Salt Lake City. Later the studio moved east a few blocks to a historic home on South Temple. Don was well known for his ability to tell a story in a single portrait image. When I interviewed Don in 2012 for my documentary "Brigham Street," I asked if he'd stay an extra hour and let me ask him questions about his photographs. Since that time, I have approached each documentary interview I do like one of Don Busath's portrait sessions. I ask myself where I can I place my interview subject so that the viewer is not only able to hear their comments, but get a glimpse into their personality and life. Here are several of Don's photographs and a short video I created from Don's comments about his portraiture style and passion for photography. Last year, I had the opportunity to produce a documentary on the history of Weber State University. One of the people I enjoyed getting to meet and interview was Rodney Brady, who passed away this week. Brady served as President of Weber State from 1978 to 1985. He is remembered by many alumni and faculty because of his goal to form Weber State into a superior undergraduate institution. Brady worked hard to inspire faculty and give them tools and resources to excel. After leaving Weber State, Brady served as President of Bonneville International and later as President and CEO of Deseret Management Corporation from 1996 to his retirement in 2009. When I interviewed Brady in his home he was quite ill from alzheimer's disease. His family had even prepared a short written statement for him to read because of his lack of stamina. However, when we started recording, it was apparent that his love for Weber State was still very strong. When the time came, Brady steered away from the prepared script, and with what seemed to be all the energy he had, delivered a sincere, unrehearsed message of appreciation for his time as President of Weber State. Here are a few photographs of Rodney Brady during his tenure at Weber State. Above you can watch a short clip about Brady taken from the documentary I produced last year. Brady is remembered as someone who championed teaching excellence. Today Weber State University gives out the annual Brady Presidential Distinguished Professor Award to outstanding faculty. One of Brady's hobbies was running. He ran many marathons and enjoyed putting on events at Weber State where he would race alongside students. Photos courtesy Weber State University Archives and Lori Memmott Brown. "The Bamberger to Lagoon" by Mary Warnock. Courtesy Weber State University and Bill Child. Today I began editing a story for the Weber State University Story Telling Festival that shares the history of the Bamberger Rail Line's passenger service to the Lagoon Resort. In 1891 the railroad company was built by Simon Bamberger and grew to offer passenger and freight service from Salt Lake City to Ogden, Utah. It was considered one of the most efficient inter-urban lines operating during the early 20th century. To give passengers an additional incentive to use the line, Bamberger made a stop in Farmington, Utah and invested in a nine acre resort named Lagoon, which still exists to this day. Here are a few photographs I was able to find at the Utah State Historical Society of the Bamberger and the Lagoon resort during that era. Images courtesy Utah State Historical Society. Last year I was commissioned by Weber State University to produce an hour long documentary on the history of the school for their 125th anniversary. The University recently posted the entire film on their Youtube Channel! Here is a link where you can watch the film. It was inspiring to learn about the many stories of challenge and triumph in the schools history and to interview key individuals who transformed Weber State University into what it is today. Hope you enjoy the film! Photos courtesy Weber State University Archives. This week I began research for a series of videos that will accompany an art exhibit at the Weber State University Story Telling Festival. 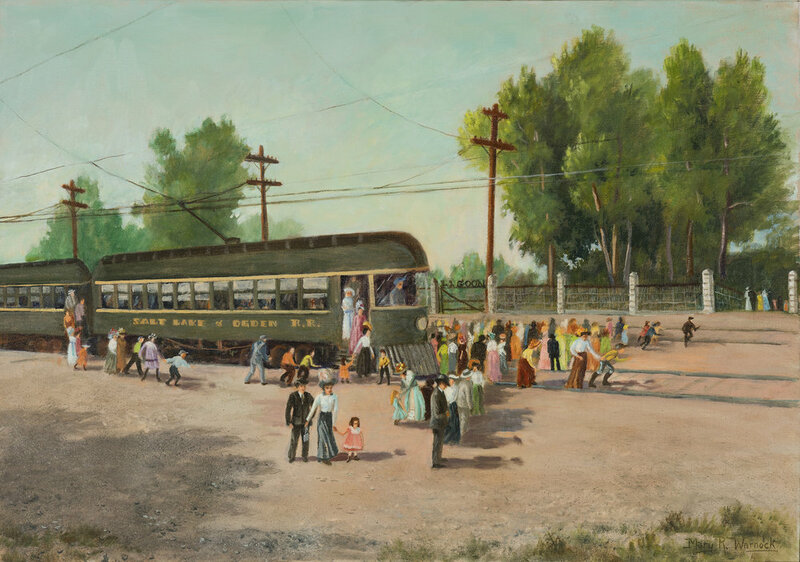 40 years ago a series of about 60 paintings were commissioned that showcased different episodes in the history of Ogden, Utah and its surrounding communities. The exhibit at this year's Story Telling Festival will display many of those paintings and include several videos that explain the history behind them. "City of Corinne - Paddle Wheeler" by Charles A. Groberg. Courtesy of Weber State University and Bill Child. I spent today at the Utah State Historical Society gathering archival photographs to include in the videos. 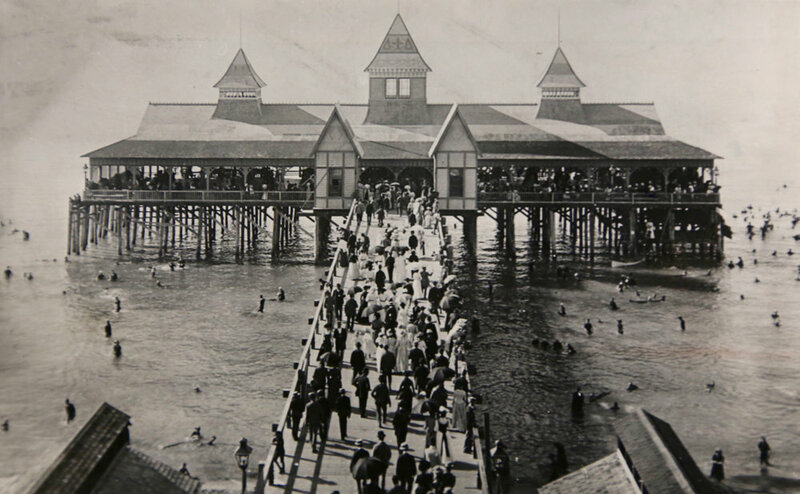 Some of my favorite images were of a resort on the shoreline of the Great Salt Lake during the 1880s. The Garfield Resort was about two miles southwest of Black Rock, a large rock you can still reach off of Interstate 80. The resort was actually named after a steam boat, the "General Garfield," which was originally named "The City of Corinne" in 1871 and had been a freight vessel to ship lumber, ore and bullion between Ophir and Corinne, Utah. Over the years the ship was converted into an excursion boat that carried passengers along the eastern shore of the Great Salt Lake. Ultimately, the machinery inside the boat was removed in 1892 and it was outfitted as a hotel at the Garfield Resort. Here are a few photos of the ship, the resort and the painting by Charles A. Groberg. Eugene Morris outside his home in Ogden, Utah (2013). This past week my friend Eugene Morris passed away. Eugene was a Vietnam Veteran who I met ten years ago while producing a documentary called Street Vets that aired on PBS. At the time he was living at the Homeless Veterans Fellowship, a transitional living facility for homeless veterans. It was here that I followed Eugene and a handful of other veterans for a year as they worked to overcome addictions, post traumatic stress and other challenges that had led them to homelessness. About a year after I'd finished shooting the documentary, Eugene called me one night and asked me to meet him at a homeless shelter. Rough times and a few poor decisions had put Eugene back on the streets. The Eugene I spoke with that night looked empty and scared. It was the lowest I'd seen him. However, as we talked, I could tell Eugene knew that wasn't where he belonged. These last few years it has been amazing to watch Eugene change his life for the better. Eugene went through a drug rehab program in 2011 and hasn't used since. In addition he gave up drinking. And when there were concerns about cancer he also gave up smoking. Now stable, Eugene was able to rent a home in Ogden, Utah where he worked on his artwork, something he has always been passionate about. I have enjoyed visiting him every few months to photograph his new prints. It has been inspirational to watch someone who has hit rock bottom, struggle and work their hardest to rebuild themselves, find new dreams and make those dreams happen. 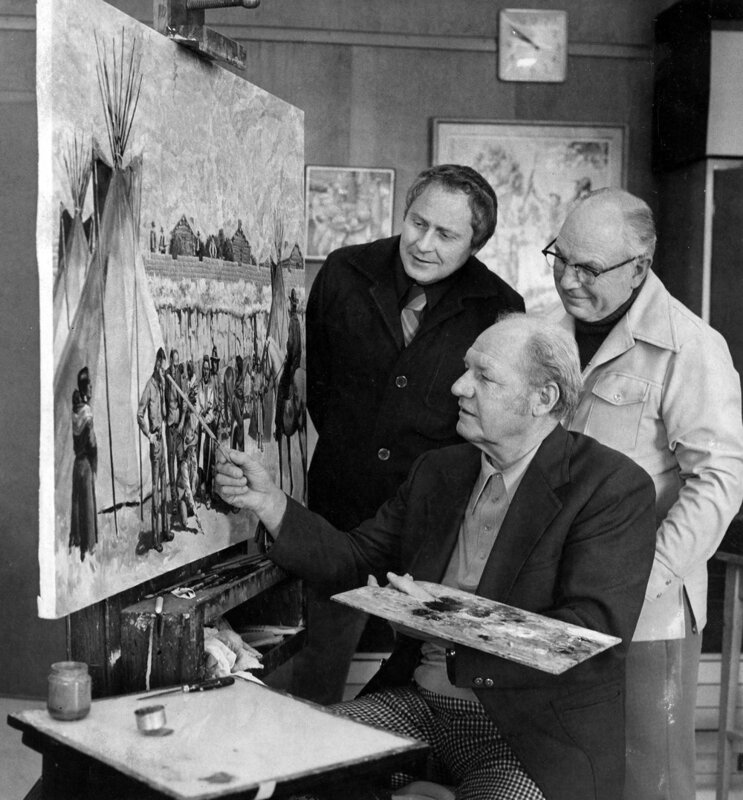 Eugene Morris drawing out a sketch for a painting while living at the Homeless Veterans Fellowship (2007). Terry Schow, former Director of the Utah Department of Veteran's Affairs, and one of Eugene's best friends, organized a memorial service for Eugene this week at the American Legion Post in Ogden, Utah. Eugene has no surviving family, so it was a special experience to meet the small group of people who knew and loved him. Below I have included a few photographs from the memorial service. Above, you can view the Street Vets documentary that Eugene appeared in. The program was filmed in 2007 and aired on PBS in 2010. For two years I've been able to assist Century 21 Everest Realty Group in their marketing and recruitment efforts. This December we launched a new recruitment video that includes interviews with Everest Agents in which they talk about the successes they have reached while working with Everest. It's a fun opportunity to go a little deeper into lives of these individuals and see how their work impacts their families and communities. This week I was able to travel to Washington, D.C. with Mormon Newsroom to document the completion of the Freedmen’s Bureau project by Family Search. A special event was held at the National Museum of African America History and Culture to recognized the work of 25,000 volunteers in the United States and Canada that uncovered the names of 1.7 million African American slaves. Through a year long online crowd sourcing project, volunteers indexed the records of the Freedman's Bureau, a government entity that was organized by congressional order in 1865. The Bureau created handwritten records of African American slaves at the end of the civil war. These records included marriage registers, hospital or patient registers, educational efforts, census lists and labor contracts. While these records have been available previously by the National Archives, the indexing project made the documents text searchable, allowing African American's to use the records to trace there genealogy. Prior to this, few African American's have been able to find family history records before 1870. It was a special experience to interview genealogists who expressed their gratitude for the project and what it has meant for them personally and their families. The event was held at the new National Museum of African American History and Culture in Washington, D.C.